Army Public School No 1, Roorkee invites applications for filling up Teaching & Non-Teaching Staff. Army Public school released notification for the recruitment of PGT, PRTs’, Supervisor Administration, Receptionist & LDC post on contractual basis. Interested candidates may apply on before 31st August 2018. PGT-Commerce (Ad-hoc) Candidate should be Post Graduate with B.Ed. with min. 50% marks in each from a recognized University. As per APSs norms. PRT-All Subjects (Ad-hoc) Candidate should be Graduate with D.El.Ed. / B.Ed. with min. 50% marks in each from a recognized University. (Other Qualifications as per CBSE Affiliation Bye Laws Chapter-IX). Supervisor Administration (Contractual) Candidate should be Graduate with min. 5 years of experience. Preference will be given to Ex-Servicemen. ESM will be considered as equivalent to a Graduate. LDC(Contractual/Ad-hoc) (a) Graduate or 10 years of service as a clerk (for ESM). Computer Literate. (b) English Typing with a minimum speed of 40 WPM. (c) Knowledge of MS Office (Speed 8000 key depressions per hour). (d) Basic Knowledge of Accounting. A candidate can apply for only 1 post only. Preference for teaching posts will be given to CSB Card holders an CTET qualified. As on 01 Sep. 2018 – Fresh Candidates below 40 years. Experienced Candidates below 57 years (in the appropriate category in last 10 years must have worked for at least 05 years). The selection for the post shall be based on a personal Interview. The interviews will be held at APS No.1 Roorkee in the month of September 2018. Call letters will be issued accordingly by post as well as E-mail to short listed candidates only. Interested and eligible candidates can take the application form, available in the official website www.aps1roorkee.com and in the school office on all working days from 09:00 am to 12:30 pm. Applications must be sent with attested copies all testimonials (Academic and Experience) latest by 31st August 2018. All the documents with application form is to be sent to “Army Public School No.1 Roorkee, BEG & Centre Roorkee Cantt-247667”. Application Forms are to be submitted along with a demand draft of Rs.100/- in Favour of “The Chairman, APS No.1 Roorkee” (non-refundable). Candidate must enclose self-addressed envelope duly affixed with postage stamp of Rs.40/-. 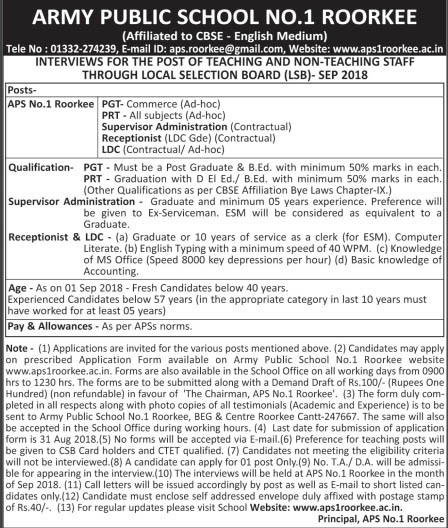 Help us to improve this article/job posting "Teaching & Non Teaching Staff Recruitment in Army Public School 1 Roorkee". We would be glad if you can comment below and provide your valuable suggestions and feedback. If this page have any wrong information/list or out of context content, then you can report us as well. Post Graduate = 21150; Shows Standard of Degrees in India. I have diploma electronoic and telecommunication but I have also a experience of it software and hardware.if any vacency for me pl inform me i have also graguate from uttrakhand open university. what is the procedure for recruitment of non teaching staff because form available in website is only for teaching staff. i hv completed my B.com(h) from (delhi univ), B.ed from indraprasth univ. delhi, M.com(ccs univ ) and also done MBA(finance) , I just want to know that Is CSB required for PGT teachers. So m interested the job in army school rookee. LDC post details is not given in the application form so how we will apply???? PRT English teacher , my B.ed is from allahabad Sahitya Sammelen , i can apply for the same . I have completed B. A in hindi. And my father is x-Army. i have a completed m.sc in microbiology from gurukul kangri university haridwar and also doing d.el.ed….i want to do job as a non teaching staff laboratory assistant or other any documentation department. I have 3 years experience. Currently I am on DDU-GKY Central govt. project as a Counsellor. My highest qualification is MBA.I have completed Graduation from Psychology Hons. If any non teaching post will be vacant then let me inform on my given mail id.